It will be displayed at Complex Systems, Health Disparities, and Population Health: Building Bridges, February 24-25 in Bethesda, MD. This post will be updated in light of any comments received. Comments welcome in advance. This entry was posted in biomedicine, Sci&TechStudies(STS) and tagged health on February 17, 2014 by Peter J. Taylor. Health: What’s Race got to do with it? 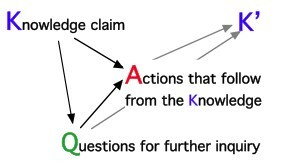 Consideration of Actions that follow from the Knowledge: What change could people pursue if they accept the Knowledge claim? K: The patient is a 54 year-old black man. A: What should you do? Q: What more do you want to know before deciding what to do? If so, let me trace two paths of learning more that you might follow, first around racism and second around ancestry. K->Q: You may know that not every man that looks black identifies as African-American, so you might first ask if he does. K->Q: You may know that self-reports of experience of racism are conditioned by class, so you might look for and use a survey that is better at probing beyond self-reports. Q: Yet, if enough doctors collected the survey data—or even the self-reports of experiences of discrimination—then researchers could assess whether there was an association between experiences of discrimination and the subjects’ responses to the various hypertension medications. K: After all, it’s implausible that experiences of discrimination have no physical effect on our bodies and it’s plausible that these effects might add up over time to produce differences in ways that bodies are hypertensive. K, A: Understandable that you say this, but instead of waiting for such results, you might do some reading after hours about the positive effects of acknowledging the topic of discrimination and, conversely, of pride in one’s identity. K->Q: You may know that not every man that looks black identifies as African-American, so you might first ask that. K’: You might discover that he is an immigrant from Africa, not a descendant of slaves in the United States. K: There is a good chance that African-Americans won’t know this, or won’t know their places of ancestry with enough precision to be helpful, or will have multiple places of origin in Africa. K: Moreover, if he is a descendant of slaves, you know he has probably has a lot of European ancestry. K: But, on second thoughts, doing the test is expensive and the insurance company doesn’t reimburse me for that. Q: Yet, if researchers collected more data about ancestry (which, given people’s imperfect knowledge of their ancestors, would probably require genetic markers) then researchers could assess whether there was an association between ancestry and responses to the different hypertension medications. K: In their spare time the doctor might learn about the competing theories for the existence of this belt (e.g., Howard et al. 2010, Kuzawa and Sweet 2009). This entry was posted in biomedicine, Sci&TechStudies(STS) and tagged beta blocker, gene, health, race on January 17, 2013 by Peter J. Taylor. 2. Putting point #1 aside, suppose we imagine an original human gene pool that dispersed at some point of time from its origins in Africa around the world and was not subject to subsequent breeding among widely dispersed parts of the pool. Cluster analysis techniques could be used on genetic data to divide humans into, say, N groups. Such clustering techniques are sensitive to assumptions that determine whether groups are of roughly equal size or are a mix of a few large groups. If we looked for groups that had similar within-group genetic variation, most of the N groups would be in Africa. In other words, the traditional subdivisions of human races would have to be reformulated. However, experience using cluster analysis in large agricultural data sets (Cooper and Hammer 1996) suggests that many individuals cannot be consistently be assigned to one group versus another; the grouping changes according to what traits (in our case, variants at genetic loci or SNPs) and how much each group is represented in the data. 3. Suppose we now add migration subsequent to the initial dispersal, but without cross-breeding among the groups. Picking up this last point in #2, if individuals from non-African groups outweigh those from African groups in, say, the United States, then how well could we recover from the U.S. data all the groups delineated in #2? That would be an empirical question, but the experience from agriculture warns us not to be optimistic. 4. Of course, #3 is only a thought-experiment. There has been considerable migration and cross-breeding subsequent to the initial dispersal from the place of human origin in Africa, including but not confined to the recent centuries of cross-Atlantic slavery and master-slave relations. How well could we recover from current individuals the one or more groups (as delineated in #2) that make up the individuals´ ancestry? Again, this is an empirical question. Biomedical researchers do not have to be politically biased to judge that research efforts might be more fruitfully directed along other avenues, such as those indicated by biomedical correlates of socially defined race (i.e., not the groups that would emerge from the cluster analyses in #2). 5. Perhaps, we could ask less than we have in #4. Rather than full recovery of original ancestries, we might seek simply want to predict whether an individual patient has some major biomedically relevant genes that differed, on average, among the original groups. These predictions, necessarily probabilistic, would be limited in value given the recently-emerged consensus that most medically significant traits are associated with many genes of quite small effect (McCarthy et al. 2008). Moreover, given that the groups delineated in #2 would not match the traditional subdivisions of human races or those current in the U.S.—there would be several different groups of African origin—medical practitioners would need to disregard superficial assignments to racial groups. They might just as well test directly for the presence or absence of the biomedically relevant genes. 6. If we put #1-5 aside and imagine a world in which we were able to use genetic information to assign humans to original post-dispersal groups as reliably as in the statistics class we were able to assign individuals to male and female groups. What could we do with that knowledge that there is a difference between the average genetic profiles for groups A and B when there is large within-group variation for most genetic loci (at least, for those that vary within the human species)? Let me accentuate this question with using the IQ test score case Sesardic has paid considerable attention to (2005). Suppose we knew (which we do not) that only a certain small set of genes influenced IQ test scores. 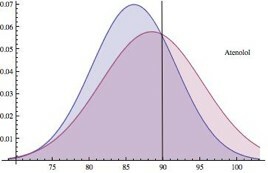 What could we do with the knowledge that there is a large difference between the average IQ test score for two groups and this difference is smaller than the within-group variation? (To visualize this situation, imagine one of the axes in the Figure is IQ test score.) I would not use my ability to assign humans to original post-dispersal groups based on genetic profiles as grounds for using an individual´s membership in a group to make educational or employment decisions for the individual. But I will not speak for Sesardic; I do not know what he thinks would follow if a biological view of race were to be rehabilitated along the lines he discusses. Cooper M, Hammer GL (eds) (1996). Plant Adaptation and Crop Improvement. CAB International, Wallingford, UK. McCarthy MI, Abecasis GR, Cardon LR, Goldstein DB, Little J, Ioannidis JPA, Hirschhorn JN (2008) Genome-wide association studies for complex traits: consensus, uncertainty and challenges. Nature Reviews Genetics 9: 356-369. Sesardic N (2010) Race: A Social Destruction of a Biological Concept. Biology and Philosophy 25:143-162. This entry was posted in biomedicine, Sci&TechStudies(STS) and tagged agricultural_research, genetics, genomics, health, migration, race, Sci&TechStudies(STS), variation on October 15, 2010 by Peter J. Taylor. Rehabilitating a biological notion of race? Neven Sesardic, a philosopher of science, is critical of positions accepted by liberal-left philosophers about heritability, genes, IQ test scores, and racial differences. His guiding theme is that philosphers need to delve more deeply into the science as they consider their arguments (2000, 2005). In his latest contribution in this spirit, Sesardic (2010) argues that ”the biological notion of race (is not at all inconsistent) with what the best contemporary science tells us about human genetic variation.” In particular, the fact that genetic variation within a group is of larger than variation between (the average of) the groups, does not mean that the groups cannot be distinguished. Let me affirm this last point with an example from a course I once took in multivariate statistics. We could not say with confidence whether a student was male and female on the basis of their height—there was too much overlap of the ranges—or, for the same reason, on the basis of their hip circumference. Yet a simple linear function that subtracted hip from height was very reliable in discriminating male from female students. In Sesardic´s figure, rotated 90 degrees below, height would be the x-axis, hip the y-axis; the squares the males, the triangles the females. This point of Sesardic is not, however, sufficient to rehabilitate a biological picture of race. In this post and the next, I sketch the issues we face once we delve deeper into the relevant scientific knowledge, concepts, methods, and questions for inquiry. Biology is more than genetic variation. For example, experience of racial discrimination by African-American women has been associated with higher risk of pre-term delivery of their babies even after controlling statistically for other factors that increase that risk (Mustillo et al. 2004). Race can be linked with biology even if races cannot be distinguished on the basis of genetic differences. Mustillo SA, Krieger N, Gunderson EP, Sidney S, McCreath H, Kiefe CI (2004) The Association of Self-Reported Experiences of Racial Discrimination with Black/White Differences in Preterm Delivery and Low Birth Weight: The CARDIA Study. American Journal Public Health 94:2125-2131. Sesardic N (2000) Philosophy of Science that Ignores Science: Race, IQ and Heritability. Philosophy of Science 67: 580-602. Sesardic N (2005) Making Sense of Heritability. Cambridge University Press, Cambridge. This entry was posted in biomedicine, Sci&TechStudies(STS) and tagged genetics, health, race, variation on October 14, 2010 by Peter J. Taylor.